Fort Omaha. —. A military post was first established here in 1868 and named Sherman Barracks after the famous Civil War general, William Tecumseh Sherman. 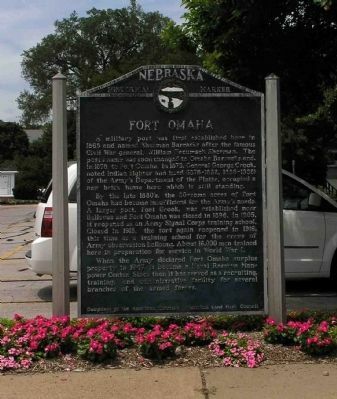 The post's name was soon changed to Omaha Barracks and, in 1878, to Fort Omaha. In 1879, General George Crook, noted Indian fighter and head (1875-1882, 1886-1888) of the Army's Department of the Platte, occupied a new brick home here, which is still standing. By the late 1880's, the 80-some acres of Fort Omaha had become insufficient for the Army's needs. A larger post, Fort Crook, was established near Bellevue and Fort Omaha was closed in 1896. 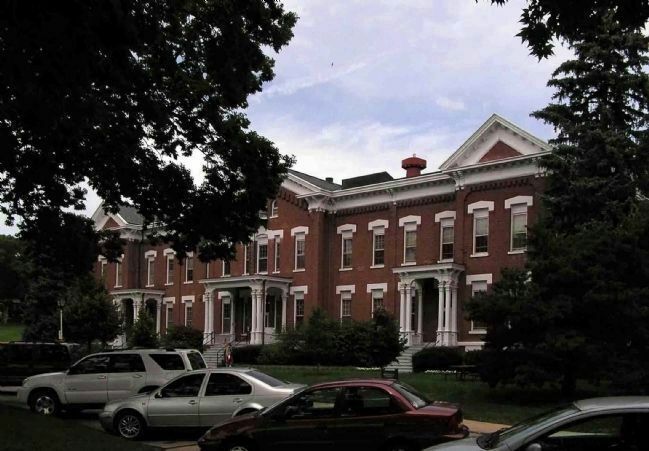 In 1905, it reopened as an Army Signal Corps training school. Closed in 1913, the fort again reopened in 1916, this time as a training school for the crews of Army observation balloons. About 16,000 men trained here in preparation for service in World War I. A military post was first established here in 1868 and named Sherman Barracks after the famous Civil War general, William Tecumseh Sherman. The post's name was soon changed to Omaha Barracks and, in 1878, to Fort Omaha. 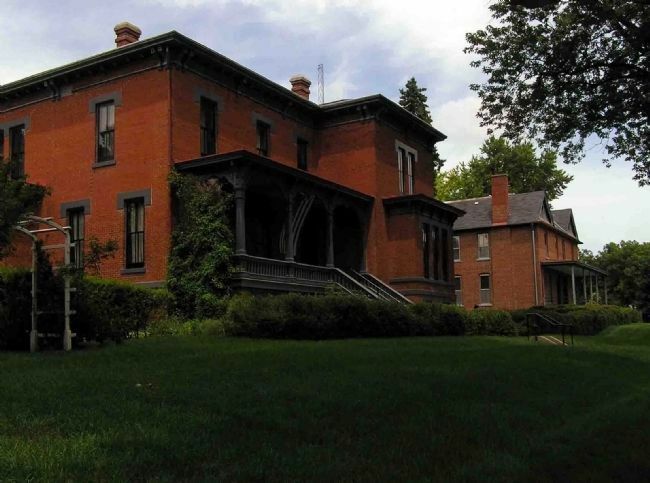 In 1879, General George Crook, noted Indian fighter and head (1875-1882, 1886-1888) of the Army's Department of the Platte, occupied a new brick home here, which is still standing. When the Army declared Fort Omaha surplus property in 1947, it became a Naval Reserve Manpower Center. Since then it has served as a recruiting, training, and administrative facility for several branches of the armed forces. 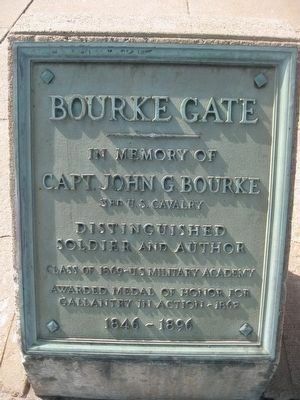 Located at the old Bourke Gate to Fort Omaha, now the main entrance to the Metropolitan Community College - Fort Omaha campus. Marker series. This marker is included in the Daughters of the American Colonists, and the Nebraska State Historical Society marker series. Location. 41° 18.408′ N, 95° 57.411′ W. Marker is in Omaha, Nebraska, in Douglas County. Marker is at the intersection of Fort Avenue and North 30th Street (U.S. 75), on the right when traveling west on Fort Avenue. Touch for map. Marker is in this post office area: Omaha NE 68111, United States of America. Touch for directions. Other nearby markers. At least 8 other markers are within walking distance of this marker. Fort Omaha Fire Station (within shouting distance of this marker); Fort Omaha Post Exchange and Gymnasium (about 300 feet away, measured in a direct line); Ordnance Magazine (about 600 feet away); Fort Omaha Guardhouse (about 600 feet away); Fort Omaha Headquarters Building (about 600 feet away); History of Fort Omaha (about 700 feet away); Quartermaster's Office and Commissary (approx. 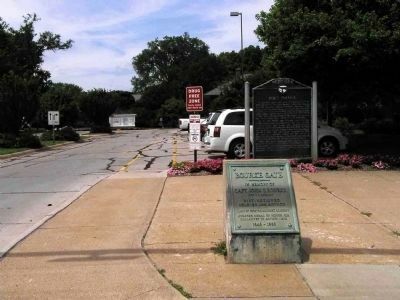 0.2 miles away); General Crook's Headquarters at Fort Omaha (approx. 0.2 miles away). Touch for a list and map of all markers in Omaha. The General Crook House (1879) in the foreground. Listed on the National Register of Historic Places, it has been restored and reopened as a museum by the Douglas County Historical Society. 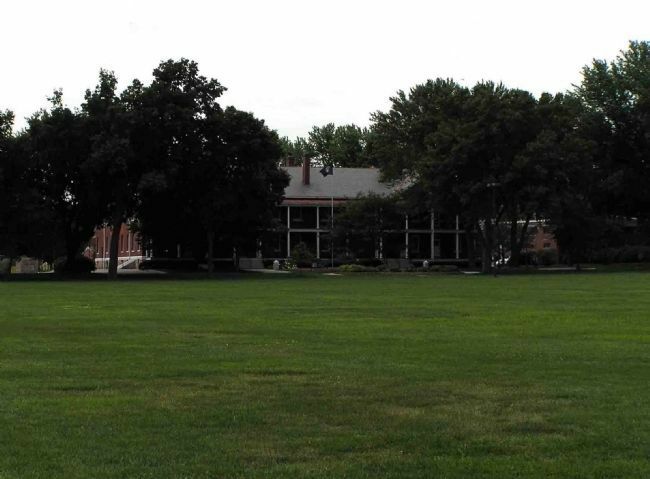 Looking across the historic parade grounds, the Depot has been renovated for use as the Metropolitan Community College - Fort Omaha Campus administrative building. More. Search the internet for Fort Omaha. Credits. This page was last revised on June 16, 2016. This page originally submitted on July 14, 2010, by PaulwC3 of Northern, Virginia. This page has been viewed 1,228 times since then and 14 times this year. Photos: 1, 2, 3, 4, 5. submitted on July 14, 2010, by PaulwC3 of Northern, Virginia. 6. submitted on January 1, 2016, by Tom Bosse of Jefferson City, Tennessee.